Night out in Bangkok, one of the best in Southeast Asia and we love it! After eight months travelling around Thailand, our budget breakdown proved that we spent more on night outs than on groceries… No shame on that!! 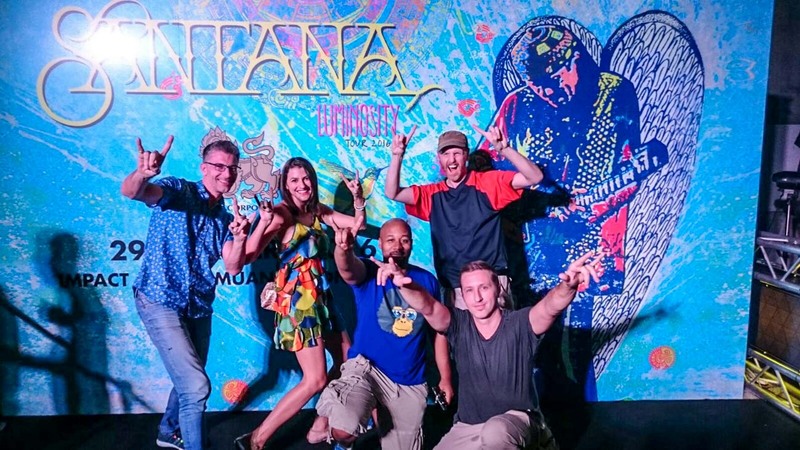 On the last day of our travels across the Land of Smiles we were invited to attend Carlos Santana Concert on Singha Vip Experience style!! Oh Yeah Baby, this is the best way to end up a trip!! The concert was last Monday and I’m still excited about, can’t stop singing his songs. Has been a long time that Rob and I didn’t attend to a big show, especially as Vip! 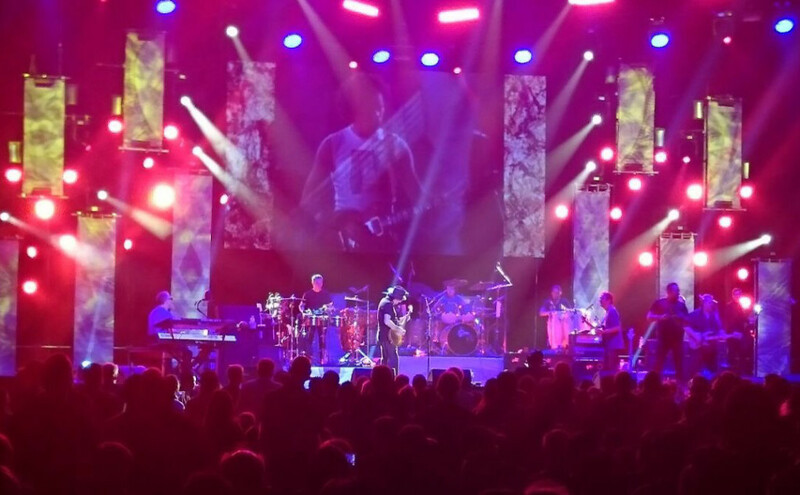 Carlos Santana playing live is reason enough to make my heart beat fast and my legs starting dance, my Latin blood can’t resist to the drums and a good guitar. But what we had that night was more than a music concert, the Vip Singha Experience made our night easy, smooth and full of fun! Before I jumped to the concert details and how amazing Carlos Santana is, let me give you some exclusive details about our Singha Vip Experience, because is not everyday that we are pampered with a driver, drinks and special seats. The concert happened at Impact Arena, a bit outside of Bangkok, and my first concern was: how do we get there on time with such a slow and busy traffic. Or even worst, how to get a taxi back to town after the show? These thoughts happen when you are not used to be a Vip! 🙂 Of course, Singha took care of everything, we had a driver to take us to Santana’s concert and back to the hotel. Better than that, because they know the traffic, they picked us up at the right time, so we could arrive at the Impact Arena a few minutes before the show started. 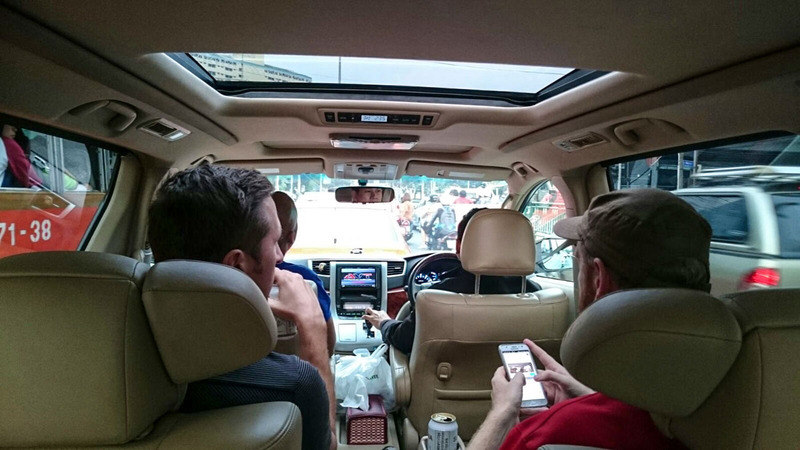 Have a driver is pretty cool, but how about a driver in big and comfy van, with cold beers and friends inside. Things only got better!!! 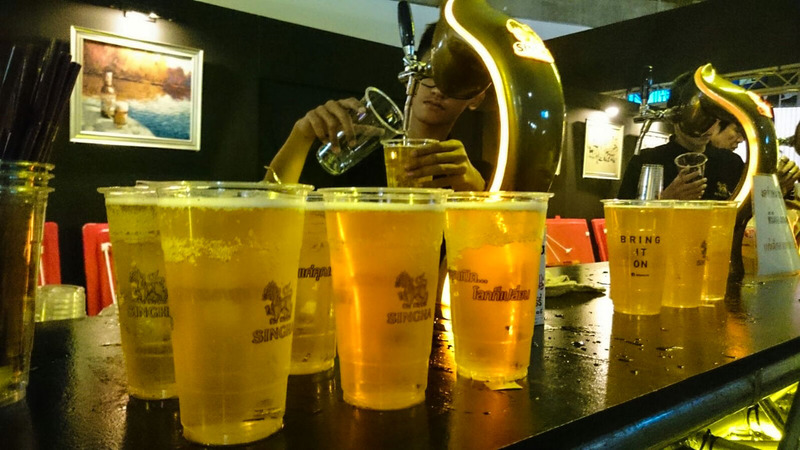 We jumped into the Vip Singha Experience with some friends what made the trip to the concert a warm up party!! I grew up listening to Santana. I remember my mum singing his songs with a broken Spanish but full of energy and love, as a truly Latina would do it. So listen to his guitar, feel his passion on the lyrics was a dream come true. Our seats were really close to the stage, a few meters from him and his band. Great view, especially because in Thailand people tend to watch the concert sitted doing a type of “chair dance”, you know when you jam your shoulders and shake your head while your right feet keep the rhythm. That’s how a concert happens in Thailand, surprisingly organized, for Brazilian standards of course. I was expecting that the dance floor would be packed and I would have to fight shoulder by shoulder to get close to Santana. However, don’t underestimate the seats and the organized crowd, they know how to have fun. After the second music, the dancers moved to the middle and side aisle to show off their hips and hands moves. Of course we were with them, I couldn’t watch Santana sited all night… When the first accords of “Maria, Mariaaaa…” was played I got on my feet and didn’t stop dance till the end of the concert. If you are not a dancer like me, you will love the seats and the possibility to rest between songs. – Bring a jacket! I’m not joking, the A/C was blowing as a winter wind, good for keeping the dancer coolers, but too cold for the seated crowd. Plus, food inside is a No – No, drinks Yeah – Yeah! Now let’s go to the main attraction: Carlos Santana!! Oh boy, he knows how to play good music!! The band was amazing, guitars, drums, keyboards, percussion and great singers. Santana looks like a maestro conducting the band! Brilliant!! The show was named Santana Luminosity, the perfect title for it. So much power, so intense, we left the place energized, eager for more good music. It’s unbelievable how after all these years he is still a young man on stage! You can see and feel that his soul was born to play guitar! From the 60’s to today, Carlos have been playing a music that it’s timeless. The mix of rock, Latin, African beats, and beautiful lyrics made his music transcend generations and country borders. During our eight months travelling across Thailand I have never seen Thai people dancing so much, and singing along. Awesome, I think that’s the word to describe the whole night! We couldn’t have chosen a better way to wrap up our nomadic journey in Thailand. After 3 months in Chiang Mai we were dying for a good party and Singha Vip Experience delivered it to us! What a night! From the moment the driver picked us up, to the end of the concert everything went smooth and unforgettable! Carlos Santana Luminosity Concert was sponsored by Singha, the traditional Thai beer brand that is behind many international events that happen in Bangkok and in all Thailand. If you like the idea of listening to your favorite artists and be pampered like a star, go for the Singha Vip Experience, no doubts you will have a great time! 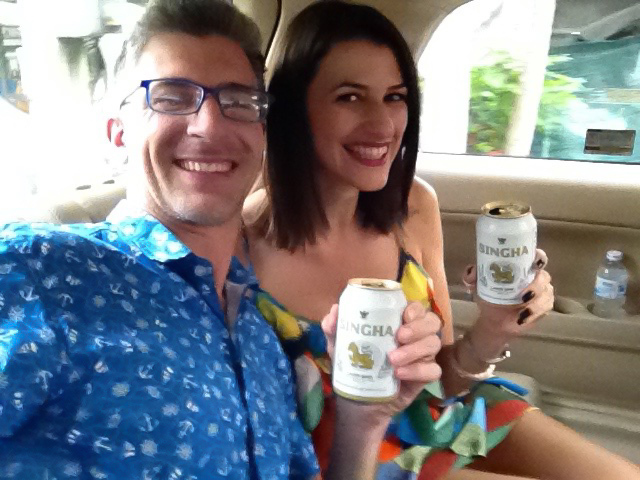 A big thanks to Singha for inviting us for the Vip Experience! As always, doesn’t matter who pays the bill, you receive our honest opinion!